Education2Aspire is a non-profit educational development program that equips teachers and school systems with strategies to help their students self-actualize both behaviorally and academically through an effort-based learning process. The approach and philosophy is unique in that the intrinsic desires of the students—rather than the external force of the school system—drive it. To empower school systems and educators to close the education gap by creating a classroom culture that supports the development of positive social, academic, and personal skills—this in turn will empower students to take ownership for developing their own routines and procedures. Using a combination of in-person teacher training and his forthcoming manual, Education2Aspire founder David T. Jones leads educational development courses for school districts that works to inspire school systems and educators in closing the educational gap. Teachers learn strategies for helping their students self actualize both behaviorally and academically through effort-based learning. Students take ownership for developing their own routines and procedures, and learn how to think critically about the work that they and their peers do. David is recognized for educational strategies that are innovative, research-based and built upon a foundation of decades of teaching in the complex urban environment. He has lead successful IFL initiatives and NSF grant programs, and is passionate in helping other educators to create a positive classroom culture. Beyond his teaching role, David also serves on the Minneapolis Public Schools Think Tank Committee, and has also served on a district committee creating new policies for student behavior. Additionally, David has coached student-athletes at various levels sharing his own experience as a Hall of Fame Athlete and U.S. Track & Field National Marathon Champion. He also represented the United States in the Armed Forces North American Pentathlon Competition. 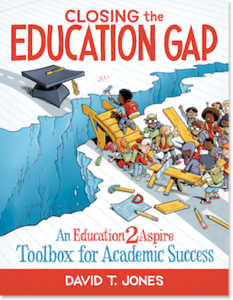 In the bustle of growing class sizes, increasingly diverse students with different needs and challenges, and limited funding, how can educators close the education gap? Education2Aspire trains teachers to cultivate strategies that allow the intrinsic desires of the students—not the external forces of the school system—to drive the students education through self-actualization. 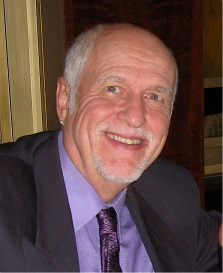 With his tested methodologies, David T. Jones leads educators to discover empowering strategies and techniques for better classroom environments. In this book you'll find a detailed description of the Education2Aspire philosophy and approach, as well as anecdotal examples of the Education2Aspire strategies in action and resources for assessments and activities. please use the contact form at the bottom of the page to request an order. Mr. Jones has the experience and commitment to rethink how we support teachers. He has both classroom experience and system-level perspectives, which are critical to the success of rethinking teacher professional development. David led mathematics workshops in Minneapolis during the summers and during the school year. In addition, he has led sessions at the state level for the Minnesota Council of Teachers of Mathematics. I have never seen another workshop leader who is as enthusiastic, creative, well-organized, and well-prepared. Mr. Jones is one of the most upbeat professionals I’ve had the privilege to encounter. At a time when teachers generally feel the nervous fatigue of negative appraisal, Mr. Jones embodies a caring and positively effervescent enthusiasm for his job that is uplifting. This development class was eye opening and a breath of fresh air! Thank you for doing this workshop. I feel like I am leaving this training with usable strategies that will create a more positive atmosphere in my classroom . . . starting today! One of the most powerful professional development programs I have ever attended. I believe any teacher will benefit from this course and find new ways to better their practice, no matter where they are in your journey to create a respectful classroom with high expectations. Inspirational training . . . whether it is your first year or fortieth year in the classroom! Education2Aspire is helping students Pre-K though grade 12 all across the Twin Cities find success in their schools and neighborhoods, but to keep costs affordable we need community support. Education2Aspire is a registered 501(c)3 and all gifts are tax deductible. Copyright © David Jones. All right reserved. OneEngine theme by EngineThemes. Edited by Echo Martin.